Israeli Prime Minister Benjamin Netanyahu has been “reaching out”, as the New York Times delicately puts it, to Democratic leaders in the U.S. Congress who were blindsided by Republican House Speaker John Boehner’s invitation to Netanyahu to address Congress March 3. AIPAC usually handles “reaching out” for Israel when needed among power players in Washington. Not this time. AIPAC, according to a U.S. Jewish media source, did not know about the speech in advance of Boehner’s invitation. The damage has to be cleaned up by Netanyahu, if he wants to save his plan to address the U.S. Congress two weeks before he faces reelection in Israel March 17. Senator Harry Reid of Nevada, the Democratic leader, said Thursday that Mr. Netanyahu had called him the previous afternoon to explain why the White House had been circumvented before he was invited to speak before Congress. The prime minister has also called Representative Nancy Pelosi of California, the House Democratic leader, and Senator Charles E. Schumer of New York, the Senate’s No. 3 Democrat. Secret talks began three weeks ago between Netanyahu, his American-born ambassador to the U.S. Ron Dermer (pictured above), and Boehner. Their goal: Bring Netanyahu back for his third appearance before Congress, an honor allowed previously only to Winston Churchill. The Speaker held up the announcement of the speech until the day after President Obama’s State of the Union address. In an action that angered the White House, Secretary of State John Kerry met with Dermer on the same day as the State of the Union, and Dermer said nothing to him about the March 3 speech. CNN reports that Dermer blames Boehner for his failure to inform Kerry about the speech. Boehner’s office said he made it clear to Israeli Ambassador Ron Dermer that “it was his (Boehner’s) prerogative to inform the White House,” and Dermer has said multiple times that is what he was led to believe. “It was the speaker’s responsibility and normal protocol for the Speaker’s office to notify the administration of the invitation,” Dermer told The Atlantic’s Jeffrey Goldberg on Friday. CNN also reports that the White House was not told of the Netanyahu invitation on January 21, until two weeks after Boehner “first asked Dermer if Netanyahu might be interested.” The Prime Minister was indeed “open in principle to an invitation”. This is a disturbing picture of the absence of diplomatic finesse in a maneuver that carries war or peace consequences. Truthout’s Robert Naiman makes a strong case as to why the speech should be postponed, starting with Boehner’s failure to consult with the White House before issuing an invitation to a foreign leader. In addition, Naiman points out, Netanyahu’s speech would afford him the opportunity to join forces with Republican leaders in attacking President Obama’s Iran policy and undermining “the US/Europe-Iran talks and put the US on a path to war with Iran”. 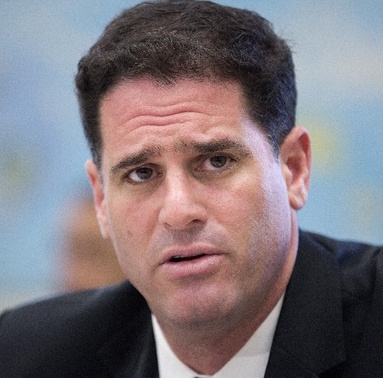 Dermer’s stock in Israeli ruling circles had been growing steadily since he moved to Israel in his middle 20s from his hometown in Miami Beach, Florida. He gave up his U.S. citizenship to take a government position before becoming Israel’s ambassador to the U.S. According to the Times, Michael Oren, another U.S.-born Israeli politician, who served as Dermer’s predecessor as ambassador to the U.S. has called on Netanyahu to cancel the speech. Oren is currently aligned against Netanyahu’s party in the upcoming Israeli elections. The ever skittish Democratic House members, do have three members willing to openly call for postponement. Ellison, Cohen and Waters are circulating a letter among House members, addressed to Speaker Boehner, asking him to postpone the invitation until after the Israeli election and until Congress has considered the issue of Iran sanctions. Will all of this activity lead to a postponement or cancellation? If like me, you learned as a child that gambling is a sin, then do not place any of these bets. Horowitz, however, has more odds listed. It will not be a sin to look at all of them. They offer a clue as to how Israel and the Congress will reestablish their relationship. The picture of Israeli Ambassador Ron Dermer at top is by Reuters. It appeared in The Atlantic. 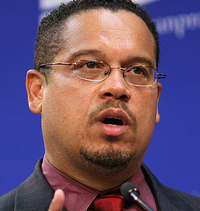 The picture of Congressman Ellison is from the Center for American Progressives. This entry was posted in Israel, John Kerry, Middle East, Netanyahu, Obama, US govermemt, War. Bookmark the permalink.